A donation to TechnoServe empowers men and women to lift themselves out of poverty. TechnoServe has 45 years of proven results delivering business solutions to poverty, and we measure our impact carefully. 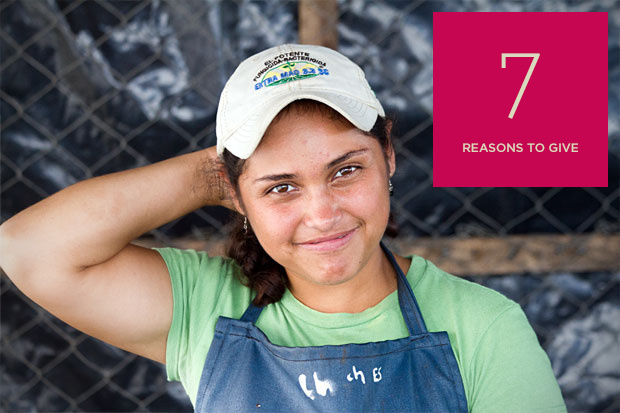 Last year, 2.9 million men, women and children benefited from our work. More than 568,000 farmers like Geister Cachique improved their practices and increased their incomes last year with TechnoServe’s support. We worked closely to connect 1,540 small businesses with the skills, financing and markets they need to grow. Businesses such as Chetana changed lives by generating jobs and economic opportunities in their communities. Throughout our history, we’ve worked to improve the lives of millions of people – and we plan to double our impact in the next five years. TechnoServe aims to build lasting solutions. We create widespread change across entire industries, like the poultry industry in Mozambique, which continues to create jobs and income even after our work has ended. You can feel confident that your donation will be used well – we have earned top ratings from Charity Navigator, GuideStar, CharityWatch and GreatNonprofits. Your support makes it possible for us to expand our highest-priority work and reach more people. Please help change the lives of millions of people by making a gift to TechnoServe today.